As many fans have heard, Tech’s athletic department has announced a departure from longtime sponsor Russell Athletic to a more classically collegiate partner in Adidas. The change was released to the public on Tuesday, Aug. 22, but some involved with or aware of the deal chose to declare the information via social media platforms, such as Twitter, on the night prior to the announcement. Todd Stansbury, Tech’s athletic director, disclosed the information to the student athletes directly affected by the transition at a welcome back meeting Monday night. The announcement follows years of sponsorship by the former brand, Russell which had sponsored Tech athletics since 2007. The discussion had included brands for consideration such as Under Armor and Nike, but the athletic department ultimately chose to sign with Adidas. 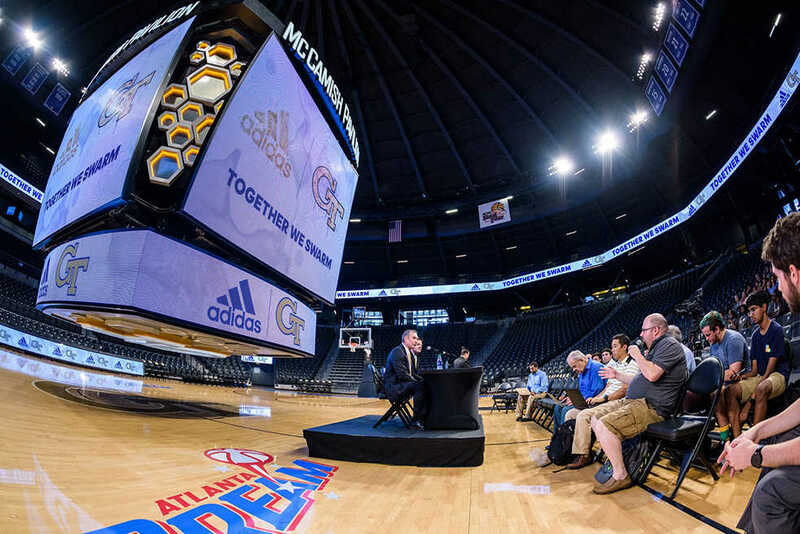 Stansbury and Jim Murphy, the latter of whom is a collegiate representative for the German company, came together at a press conference on Tuesday at McCamish Pavilion to discuss the deal and its implications for the future of the athletic program. Stansbury began the press conference by stating that the new relationship with Adidas will “refine and elevate the Georgia Tech Athletics brand.” He attributed that statement to the fact that he and many of the athletics faculty see a strong similarity between the values held by the athletic company and the Institute, a greater bond than the typical provider-customer relationship. Murphy expressed the excitement of those at Adidas, as the brand aims to build a future through partnering with Tech’s innovative culture. Certainly, the locale of the university presents numerous opportunities for the brand in terms of expansion and integration with an urban population. As a large sportswear company, Adidas will look to Tech students to help shape the growth and improvement of the brand and its products. After their statements, Stansbury and Murphy answered questions from the media on the transition between Russell and Adidas, revealing that the Jackets plan to make the switch in July of 2018, even though the baseball team already sports Adidas cleats. Stansbury emphasized that “respect” for the former was key, particularly since its founders are Tech alumni. When the Technique asked Murphy to elaborate on how the brand projects to interact with Georgia Tech, he pointed out the desire for Adidas to step away from the “transactional” methods of sponsorship and step into an extensive, integrative relationship. Both parties look to learn from one another and use one another’s platform to reach other groups while working in a collaborative fashion, particularly important since both are attempting to shape their brands dramatically. There are a few significant advantages for Tech in moving to Adidas. Firstly, the brand has garnered more praise from recruits than Russell. In a survey distributed to 100 recruits by sports media company Pick Six Previews, Adidas’ uniforms scored an 8.1 on a 10-point scale (where 10 is the most desirable), while Russell Athletic’s brought up the rear with an uninspiring 2.9. Adidas still trails behind Nike in desirability, but second place should be welcome news for Tech’s athletic administration and recruiters. leading footwear company within the United States, although it has been renowned throughout the European countries since its creation in 1949. The company is known for its partnerships with soccer leagues throughout the world, as well as sponsorships of various professional athletes. Other Adidas sponsorships within the college realm include North Carolina State University, Miami University and Texas A&M, amongst others. There are plenty of questions left to be asked about this change, especially with previous Russell involvement, such as endowed scholarships now up in the air. But overall, the change from Russell to Adidas as an athletic sponsor reflects well on the early returns of Todd Stansbury’s tenure, as well as the athlete population whom he aims to lead and direct. Both Adidas and Tech hope that the partnership will be a more fruitful one than Tech’s pact with Russell, with better support on campus and in the Tech community, as well as in the homes of prospective recruits.